Stepping into the musty shadows of Leytonstone Library is the last thing anyone would want to do on a glorious sunny day. But it's here that you’ll find a stunning, bittersweet meditation on the fleeting magical power of summer that only intensifies the weather outside. The Paper Architect is the latest work by Davy and Kristin McGuire, a husband-wife team who specialise in combining theatre, sculpture and projection mapping. To say more might be to give away the ingredients these alchemists use in a minimalist show that might just take your breath away if you don’t know what’s coming next. We'll say what we can: a tiny room, a tiny audience, a mumbling old man. Then suddenly, somehow, a teleportation to a Garden of Eden and an astonishing evocation of the most elemental emotions: the weight of desire and the unbearable sadness of near-forgotten nostalgia. The Paper Architect is as delicate as a poem by Keats, like someone pressing on a pressure point you didn’t know you had. Despite the exquisite smallness of this performance, it would be fascinating to see what the McGuires would do with a bigger canvas to work on. Though perhaps that’s looking at things the wrong way round – perhaps they just need to go smaller. 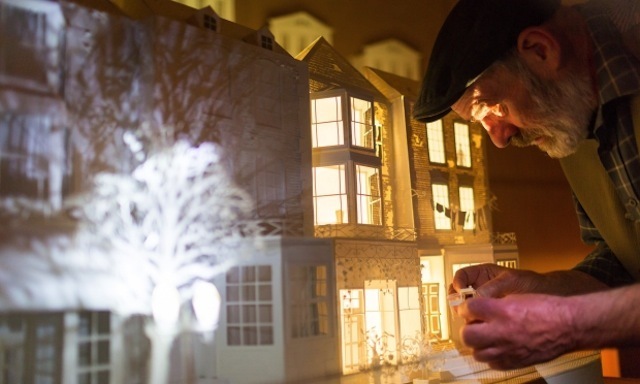 The Paper Architect was funded by the Oxford Samuel Beckett Theatre Trust and co-produced by the Barbican with Create London. It runs until 21 July. Tickets are £14. We saw this show on a complimentary free ticket.